Time to take a visit to the Mac App Store's Updates tab, because OS X 10.9.3 has arrived, along with iTunes 11.2. 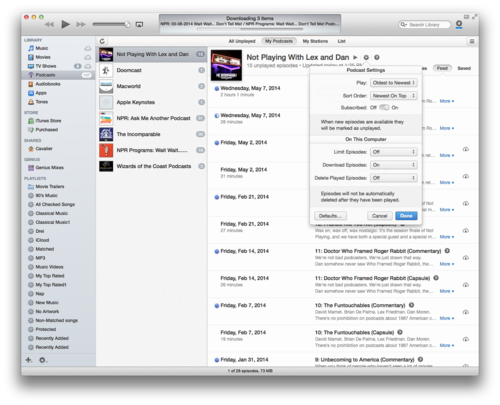 The latest update to Apple's desktop operating system brings a number of bug fixes and improvements, while the new version of iTunes adds some enhancements for podcast listeners. The Mavericks update improves support for 4K displays on the new Mac Pro as well as the 15-inch Retina MacBook (Late 2013), improves the reliability of VPN connections that use the IPSec protocol. It also lists the ability to sync contacts and calendars between a Mac and iOS device using a USB connection--a feature that used to be the province of iTunes. It's unclear at this point exactly what that entails. There are also the usual security patches, though the knowledge base document detailing them had not been updated as of the writing of this article. OS X 10.9.3 had previously been available as a public beta via Apple's recently launched Beta Seed program. iTunes 11.2, meanwhile, makes a number of changes to its podcast support, an area that's been a bit of a sore spot for many users. The Unplayed tab has been revamped, making it easier to find episodes you haven't listened to, while a new Feed tab makes it easier to browse episodes available to download or stream. The update also touts the ability to save favorite episodes on your computer, as well as automatic deletion of episodes after playback. Like 10.9.3, iTunes 11.2 includes assorted security updates. The Mavericks update is currently only available via the Mac App Store, though it should arrived at Apple's support downloads site before long; iTunes, meanwhile, is available via the Mac App Store or Apple's iTunes site, and does not require OS X 10.9.3.